I’ve read several librarian memoirs. For the most part, they didn’t capture my profession as I experience it. I’ve read many inspirational stories of overcoming health problems, and for the most part, they seem either to be self serving, to promote some hidden agenda, to be laden with false cheeriness, or just to fail to capture the experience in terms that others would understand. And finally, I’ve ready many descriptions of growing up in the Mormon faith, and they either haven’t matched my experience, or again, have been tainted by hidden agendas. 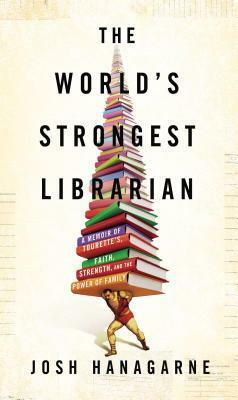 That’s why I found it remarkable that Josh Hanagarne’s memoir, The World’s Strongest Librarian: a Memoir of Tourette’s, Faith, Strength, and the Power of Family, proved successful on all three fronts. Hanagarne grew up in a somewhat unusual but loving family, but he encountered an obstacle early in life, when all of the tics associated with Tourette’s Syndrome began to manifest in him. The book is the story of his family life, his many struggles to keep his illness in check, and how his connection to his religion, his discovery of an occupation in librarianship, his love of weightlifting, and his relationships with his parents and wife all helped him in his struggle. Each chapter begins with a story from his library work, then follows the strand of that experience to connections in the rest of his life and personal history. It’s an odd construction, and an odd combination of personal traits, but Hanagarne makes it work, and in the process really captures the daily experience of working with the public in a library. This is the kind of story that could easily become maudlin, but Hanagarne’s easy use of humor, finding laughs in the most embarrassing of situations, overcomes any note of false sentiment. He’s also refreshingly honest, willing to embrace life’s contradictions, his own failures, and his moments of doubt. This combination of humor and honesty left this reader with a strong sense that Hanagarne would be a great acquaintance: insightful, but not so stuck in his own experience or so full of himself that he couldn’t admit when he didn’t have the answer. Those are great qualities for a memoir writer, and Hanagarne shows them plentifully. Interesting book, definitely will have a flick through. I’m a fairly new author, is there any advice you’d give to someone trying to make a good book? I’d honestly appreciate anything, atm my blog posts consist of short stories I’ve wrote but I’m writing a novel currently and any advice would be welcome. Reblogged this on DIVERGENT: benzonbarrientos. a good book, full of meaning! Wow! a piece worth reading ..toi will read it! I usually would not be overly interested in memoirs, but this one looks really great. Like you said, they do seem to be pretty maudlin, but based on what you said about the humor of the book, I hope to give this one a shot. Hopefully I’ll pick it up next time I’m at the bookstore. They call it the ìself-censorî, simply because youíre too self-conscious of your composing, too judgmental.